We've seen movies before where we question the mind's eye against reality, but we haven't really seen it through Martin Scorsese's line of sight. He teases the notion a bit in Bringing Out the Dead, arguably the director's most scatterbrained creation, but he mostly roots his work in gritty actuality and a sprawling sense of truth. Now, he brings us Shutter Island, an adaptation on a mind-rattling novel from Dennis Lehane, where every corner we turn leaves us uneasy about the ground the characters tread on. This is foreign territory for the celebrated director, a picture that's dark, mysterious, and labyrinthine in psychosis; and, though flawed and conventional to a judicious degree, the execution of its tension and atmosphere proves that Scorsese can handle spooky ground with the best of them. It's not the director's best dramatic work, but it's certainly one of the finer psychological suspense pictures of recent memory. Amid a foggy opening shot with the emerging mast of a ship coming into view, the story fixes on Federal Marshall Teddy Daniels (Leonardo DiCaprio) as he crosses a ferry with new partner Chuck (Mark Ruffalo) over to Shutter Island to investigate a missing person. The missing person is actually an escapee from Ashecliffe Asylum, something like Alcatraz for the insane, who was brought to the island because of her murderous tendencies. In fact, all of the prisoners -- excuse me, patients -- have committed some brash crime, most of them for murder. Teddy and Chuck, after surrendering their fire arms and having an expository chat with asylum head Dr. Cawley (Ben Kingsley) about his practices and regulations, begin to scour the island for clues. What they unearth will test their will, their perception of the truth, and their own sanity, as Teddy begins a downward spiral into instability as visions of his dead wife Dolores (Michelle Williams) and his stint in World War II cripple his perception. 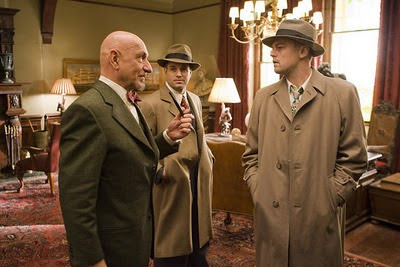 Scorsese brings in cinematographer Robert Richardson (The Aviator, Kill Bill) to lens Shutter Island, a wise move since the picture largely swings on its visual aura. The two of them create a dreary look for Lehane's mystery, riddled with rain-drenched sequences and scaled, foreboding shots that emphasize the massive yet finite nature of the intricate island. As they focus on the federal marshalls' interrogations, the photography captures the twitchy electricity brewing in the room as Teddy and Chuck push the buttons of both the inmates and the staff -- creating a cold, unnerving atmosphere. This frigid current only grows deeper as they tunnel into the dark halls and forbidden buildings on the island, rendering an environment that's ripe for mental turmoil for just about anyone who steps off the ferry and into Ashecliffe. That's the springboard for the film's tension, as the picture descends into sinister territory. It's hard to figure out exactly what category of film Shutter Island fits in because of its usage of a dark sect of human history, maybe offering a taste of horror due to its primitive, lingering fear. Continuing into the '50s when it's set, some mental institutions were still prone to troubling practices (lobotomy, violent experimentation) within their walls, content addressed in both the book and Milos Forman's film adaptation of "One Flew Over the Cockoo's Nest". Scorsese expounds on a similarly grim emotional texture as we approach the film's revelations, creating bleakness about the island's many moving, ominous parts -- and about Teddy's real reason for being assigned to this particular missing person's case. He's not unlike McMurphy, the lead character in "One Flew Under the Cockoo's Nest", in that he's quite possibly the only person there that's not either criminally insane or out to keep him shackled to the island, a fact that becomes supremely important as his time there extends. 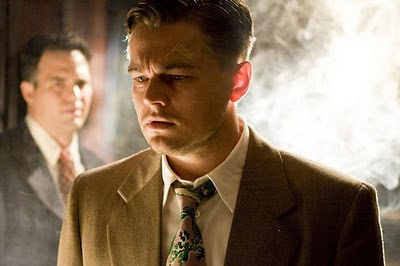 Much of Shutter Island revolves around Teddy's deteriorating composure as he digs deeper into Ashecliffe, caused by a blend of post-traumatic stress from his time in World War II and the death of his wife, and the focus that Scorsese brings to blending his grasp on the island with the maddening atmosphere is astonishing. DiCaprio offers a stellar performance as the Northeastern-accented Teddy, again proving that he's able to render a man's waning sanity -- much like his turn as Howard Hughes in The Aviator -- with impeccable authenticity. Glimmers of Teddy's experiences at the concentration camp in Dachau flush into frame throughout, which serve a double purpose; along with emphasizing the mental turmoil he's endured, they also help to parallel with the "evil" nature of Ashecliffe Asylum. Similar internalized sequences fail to make straight sense to us, such as a breathtaking, lengthy scene involving Teddy as he embraces his dead, bloody wife amid falling ash, but patience with Scorsese's method proves highly rewarding in this case. Having patience with Shutter Island's methodically-paced 138-minute runtime shouldn't be a problem, because the marriage between haunting flashbacks, maze-like darkness through Ashecliffe, and the revelatory nature underneath its desolate recesses can be thoroughly mesmerizing -- even if they're foreseeable almost to a fault. It's a movie that's all about mood, not so much about the formulaic activity that it musters from the ashes; Scorsese is a bit of a puppet master as he moves the components of a familiar genre film around, sure, but it's handled to such a finely-tuned, entrancing degree that it doesn't matter. Watching the revelations play out is like reading a thrice-visited classic mystery novel, one where the joy in exploring it comes more in moody prose, interconnecting clues, and distinctive atmosphere instead of being impressed with its bombshell ingenuity. The big question built within Shutter Island, as the mystery implodes onto itself with fear of Ashecliffe's violent practices and reflection on the demons of Teddy's past, is why Dr. Cawley and his staff -- including overseer Dr. Naehring (Max Von Sydow) -- want to prevent the two Federal Marshalls from leaving. Little clues are scattered throughout that suggest an answer, a familiar one to narratives of this type; naturally, I'll stray from revealing any of the details. However, there's only a marginal slate of predictability to the grand reveal in Scorsese's picture, a lengthy, multifaceted connection of both common and surprising elements that leaves much to pine over once the credits roll. As grim as it might be, I couldn't help myself from pondering all of the moving parts Scorsese put into action, along with whether the answer he offers is really the unequivocal end-all, be-all resolution. When a film proficiently messes with your mind to this degree, long after watching it, you know you're onto something of quality.